Apple iPhone 5S. Apple iPhone 5c. Even shard objects such as knives and keys will not scratch the protector. Whole Transparency: The protector is 0.4mm thick and made with chemically treated, transparent tempered glass. This Premium Screen Protector is easy to clean and is designed for Apple and Universal phones. The tinted anti-peeping feature is designed to protect the user's privacy. Additional features include 9H hardness, and anti-glare protection, and the surface is easily washable and reusable. 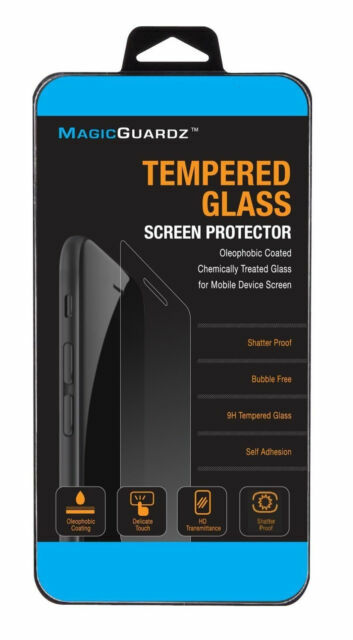 This product is made of tempered glass: in case the phone falls on a hard surface, the screen protector absorbs the impact to leave the screen intact. Pretty sweet. Easy to install. Seriously out of the many iphone screens i replaced (have kids). This is the by far the easiest one i have ever put on. and for the air bubbles easy to squeeze out. for about $1 a piece well worth it. There is on thing you have to line it up perfect on the home button. but that is like any other screen protectors out there. Well worth the money. Feels like a sheet of glass! I think this is fine for the money. Way less than buying it at a store but I followed all the directions exactly and yet the 4 corners and center sides don't stay down so there is always that clouded haze look there. Since the problem occurs symmetrically across the phone it is highly improbable that this was due to user error, which would be more excusable if it was only in one place. It doesn't affect the use of the phone as these aren't areas you need to touch but it is slightly annoying. I have a 5c, which is one of the recommended models. I'd have to try it again on another phone to see if this was just a one-time defect. Still, I am cheap and would buy it again over spending $20 in a store. This seems to be a typical glass screen protector. It was easy to install and seems to be decent quality. It has a very attractive price. The only reason I didn't give it 5 stars, is that the corners lift a little and don't stay down tight. Maybe the adhesive could be a little better? If my case wrapped around over the edge of the glass that would probably take care of it. But overall, I am giving it a thumbs up. It's a nice product for the price, easy to use and apply but 1 had a small crack and another had a tiny chip. Both were on the top left corner. The last one had no damage. Overall though it's a good buy to protect your iPhone. I got mine 2 days early as well which was nice. It didn't stick very well either and left spots but that can be expected. Thank you! These are a cheap way to protect your expensive IPhone, especially considering how expensive a screen replacement costs. I recommend everyone get a pack of these, worth every penny. You will eventually use all of them since they are so thin, they are prone to cracking/chips but it will take the impact of drops and bumps and keep the phones screen from damage.